We are offering Thermal Monitoring Equipment. In today’s commercial environment the continued operation of mission critical buildings now has the objective of zero unscheduled downtime and minimal scheduled downtime.The most common cause of electrical failure are bad connections. These cannot be detected via metering or load measurements, power quality etc. However, the thermal increase can be detected using thermally sensitive devices. Thermal imaging inspections are normally carried out once or twice per year (1 or 2 out of 365). Also, the inspections are done from OUTSIDE the enclosure in which the equipment is located. Even thermal windows don’t overcome the problems; they improve the view from camera to target, but don’t resolve some key issues, like how to inspect targets with no direct line ofsight, nor the fact that the inspections remain periodic, and also add significant cost. Exertherm provides a major breakthrough by providing 24x7CONTINUOUS Thermal Monitoring from INSIDE the enclosure, rather than periodic inspections from outside. Exertherm provides capability for data logging / on-going trend analysis and user definable alarms. Warning and critical alarms can be configured which trigger in the event the temperature of any monitored component exceeds the pre-set limits. Exertherm is easily installed (new/ retro) & integrates with most BMS/ SCADA systems. 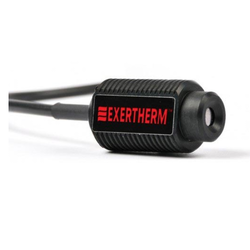 1 Exertherm utilizes small plastic, non-contact IR sensors which require no external power, have lifetime calibration & deliver ΔT measurement. These are placed INSIDE the enclosure, directly monitoring key connections.2 Cable joints can be monitored using a patented cable sensor which straps to the cable & delivers ΔT measurement.3 These connect to data cards (8 per card), which collect condition & transmit the data to the host system.4 Data cards utilize industry standard Mod Bus protocol for easy integration.5 Delivering the data to an existing BMS system is a straight forward process.6 This facilitates the thermal monitoring of all critical equipment, not just in one building, but for any location via WAN Intranet/Wireless etc. The Exertherm™ Data Card is a high performance, remote data acquistion card for use in the Exertherm™ 24x7 Thermal Monitoring System. The data card has the ability to filter, linearize and condition the signal from up to 8 various Exertherm™ sensors. The Exertherm™ Data Card is DIN rail mountable and 24V dc powered, processed information is offered via industry standard RS485 Modbus RTU protocol. This enables simple & easy integration into any existing host BMS, EMS or SCADA system. The power wiring of the Data Card allows daisy chaining to simplify and minimize PSU requirements. Coloured LED's mounted on the unit provide indication of the data card health, power status and the Modbus communications activity. The Exertherm Alarm Relay Module Plus (ARM+) is ideal for those who wish to continuously thermally monitor critical electrical circuits, 100% of operational time, rather than rely on one day per year thermal inspections. It is designed for busy engineers who require a simple monitoring system to just inform when and where a fault is detected. And is entirely vendor neutral (e.g. can be fitted to any manufacturer's equipment). 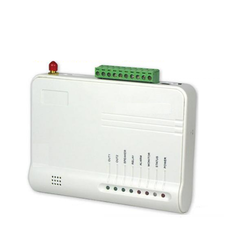 This simple to use, plug and play device which has 2 sets of dry relay contacts, which allows for connection to a local alarm signal and also to a BMS or SCADA system. The ARM+ allows for the connection of up to a maximum of 10 Exertherm Datacards (80 Exertherm IR or Cable Sensors). The ARM+ is connected to the Datacards via a pre- manufactured Comms cable (part no. 800445) which is supplied with the ARM+. Looking for Thermal Monitoring ?